This makes 3 fig flatbreads and 3 bell pepper flatbreads. Mix together the spelt flour and the salt in a medium bowl or in the food processor. Add the water little by little and knead until everything comes together. Turn the dough on a lightly floured surface and knead until the dough is smooth. Form a ball and wrap in plastic foil. Leave to rest for 1 hour. In the meantime melt the honey in a small non-stick pan. Add the hazelnuts and let caramelize slightly. Don't leave the pan unattended and shake it very often. Transfer the caramelized hazelnuts on a plate and let cool. Mix the cream cheese, milk, thyme leaves and salt to pepper to taste in a small bowl. Set aside. When the resting hour is up, divide the dough into 6 balls. Flour the working surface lightly. Flatten each ball a little and roll it very thinly in the form of a flatbread. Place the flatbreads on trays lined with baking paper. Spread the cream cheese on all the breads. Slice the figs. Halve the salami slices. 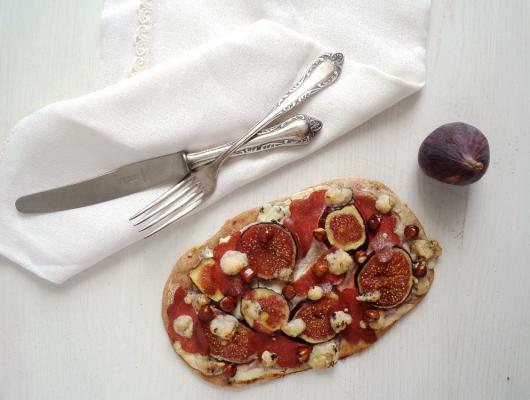 Arrange the figs slices and half of the salami slices on 3 of the flatbreads. Crumble the blue goat cheese on top and bake for about 12 minutes until the edges of the flatbreads are quite crispy. Take out of the oven and arrange the caramelized hazelnuts on top. Cut the pepper into thin strips. Chop the scallions. Arrange the pepper strips, the rest of the salami slices and the scallions on the other 3 flatbreads. Sprinkle with the grated Gouda cheese and bake for 12 minutes until the edges of the flatbreads are quite crispy.